During celebrations held in November 1983 to mark the 25th anniversary of the F27 entering airline service, Fokker announced the launch of a 50-seat follow-on to be known as the Fokker 50. Based on the F27 airframe, but fitted with more fuel-efficient Canadian-built P&W 125B turboprops engines, 12 foot diameter, six-bladed DowtyRotol 'quiet' propellers, improved aerodynamics, a redesigned cockpit incorporating digital avionics CRT "glass" cockpit and a new cabin interior, the external differences include extra windows, twin-nosewheel landing gear and upturned wingtips. Much use is made of lighter composite materials, and F50 commonality with the F27 is only 20%. Production is shared with Dassault, Fuji Heavy Industries, Deutsche Airbus, SABCA, Dowty Rotol and Pratt & Whitney Canada with final assembly, systems integration and flight test carried out by Fokker at Schiphol. The first two prototypes were conversions of F27 airframes, with the first (PH-OSO), flying on 28 December 1985 followed by (PH-OSI) on 30 April 1986. The first production aircraft (PH-DMO) flew on 13 February 1987 and first delivery made (to DLT), on 7 August 1987. 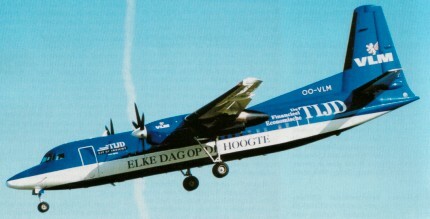 By mid-1991 Fokker held firm orders from 18 customers for 132 Fokker 50s, and had delivered 116. The standard production variant was the 46/50-seat Fokker 50-100 and the 1998 build rate was 30 aircraft per year. Four maritime/surveillance versions of the PW124-powered Fokker 50 supersed the F.27 Maritime models. The Maritime Mk.2 is the standard unarmed maritime patrol version for coastal surveillance and SAR, while the Maritime Enforcer Mk.2 is similar but has provision for external stores to allow ASW/ASV missions to be flown. Both variants are fitted with a Litton APS-140(V) or APS-504(V)5 360o scan search radar. The Enforcer also has a sonobuoy processing system. Intended for border surveillance and stand-off reconnaissance, the Sentinel Mk.2 has a Motorola APS-135(V) slide-looking airborne radar (Slar) under the fuselage. Other systems include a Doppler moving target indicator, a Litton/Itek long-range oblique photography (Lorop) system, and an optional computerised intelligence gathering system. The Kingbird Mk.2 is an AEW version. Rekkof Restart was formed with intention of restarting production of the Fokker 50 and 100, having bought tooling and rented the production factory in 1998. Engine: 2 x PW124 turboprop. Initial ROC: 390 m / min.